Today’s “Golden Cinnamon-Pumpkin Bars” are probably more suited for Fall, but I like pumpkin year round and made them anyway. 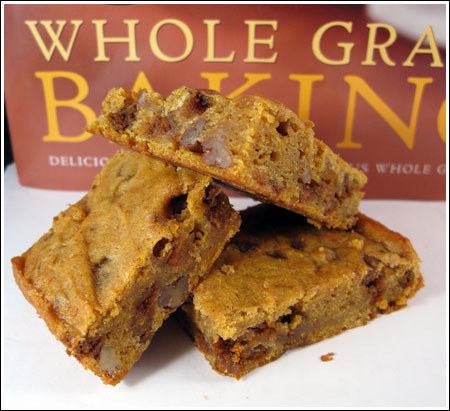 What’s great about these pumpkin bars is not only are they made with whole wheat flour, they are dense and moist rather than cakey. They’re like brownies, but with pumpkin flavor. I used cinnamon chips, but chocolate chips would be great as well. This is adapted from the King Arthur Whole Grain Baking Book. Preheat oven to 350 degrees F. Spray a 13×9 inch metal pan with cooking spray or line with foil and spray foil. Melt the butter in a microwave-safe bowl. Stir in the sugar. Return the bowl to microwave and heat for another 30 seconds or just until it starts to bubble. Let cool until it’s comfortable to touch, then stir in the baking powder, salt, cinnamon, pumpkin pie spice and egg. When well mixed, stir in pumpkin. Add the flour, cinnamon chips and nuts or raisins and stir until mixed. Pour into pan and bake for 40 minutes or until toothpick inserted comes out clean. Cool on a wire rack. You only need 170 grams of flour. You can use either whole wheat flour or white whole wheat flour. The reason I specified to weigh out the white whole wheat flour is because the volumes might differ slightly, whereas 170 grams is 170 grams. So if you’re going to use white whole wheat, it’s best to weigh out the flour if you have a scale. When making the golden cinnamon pumpkin bars, do you use both kinds of flour? Hi, if I only have cinnamon, ginger, and nutmeg, do you think that would be an acceptable substitute for pumpkin pie spice? These are great! I made them just like the recipe, with cinnamon chips an pecans. Raisins would be good, too. These are awesome!! I used white flour, as I did not have whole wheat on hand. I also could not find the cinnamon chips, and used butterscotch ones instead. And, instead of nuts, I used 1/2 cup of golden flax seeds. Yum!!! I finally made these today, using chocolate chips and walnuts. The batter seemed a little thin and the bars are not that high but they are delicious, mine baked for only 35 minutes. I’m a huge pumpkin chocolate fan and am happy to add this recipe to my repetoire! This also tastes great if you mixed the cake and butter with the other ingredients (which I did by accident the first time I made it). It tastes like a great pumpkin cake and less like pumpkin pie with a topping. I’m a year round pumpkin-a-holic too. I would make this and then I would eat the whole thing. Perfect timing! I just bought three 29 oz cans of pumpkin. I love to make pumpkin carrot cake for Easter, but I will have to try these bars too. Anna, your pic is awesome. I too love pumpkin all year round…it is one of those comfort foods that I associate with the happiness of the holidays. Oh boy…you tempt me so bad! I just made pumpkin panna cotta from freshly made puree. Now I want to go & get some more pumpkins & make this…great great post! Oh yum these look sooo good. I am totally trying them. I love the cinnamon chips idea – maybe I’m crazy but I get tired of chocolate chips! Winter, spring, summer, or fall….all you have to do is bake with pumpkin. Yummy! What a GREAT recipe. I too have been in a pumpkin mood these day and I LOVE the idea of the whole wheat flour. The cinnamon chips sound like the perfect “spark”. You read my mind — sort of. I was considering canned pumpkin to replace the banana in your banana chocolate chip bar recipe. Then I discovered the canned pumpkin I thought was in my pantry was gone. Back to the banana….but my husband ate the only one in the house as a snack. So no bars yet…..These look wonderful and I like that they are like brownies only in pumpkin form. I just cut a small corner to taste….these bars are wonderful!!! I added 1/2 cup golden raisins in addition to the pecans. Thank you, thank you, thank you!!! I’ve been in a pumpkin mood, too! In fact, I made the pumpkin harvest loaf you posted a few months back(with the chocolate layer in the middle) last night and just had some for breakfast. I think I have enough pumpkin left to try this one. Wow, those look sooo good! It’s raining and dreary here…a perfect day for baking. Thanks! Mmm, those bars look divine. I love pumpkin all year round, too!! those look fabulous! i’m a big fan of “year-round pumpkin,” too. avoiding the best-tasting baking flavor (IMHO) is like the old “don’t wear white after labor day” rule- obsolete! We all need some preservatives.